Last week, like every autumn, thousands of cranes flew in aerodynamic wedge formation over my study, heralding the end of the year. Every year, these gracious birds move from their breeding ground in Scandinavia, Sibiria or even Northern or Eastern Germany in very neat passages towards the south to overwinter in the woods of common oaks of the spanish Extramadura Region. 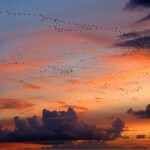 In the course of the climate warming they partly only migrate as far as Southern France. With their subtle meteorological sense they can feel upcoming cold spells very precisely. 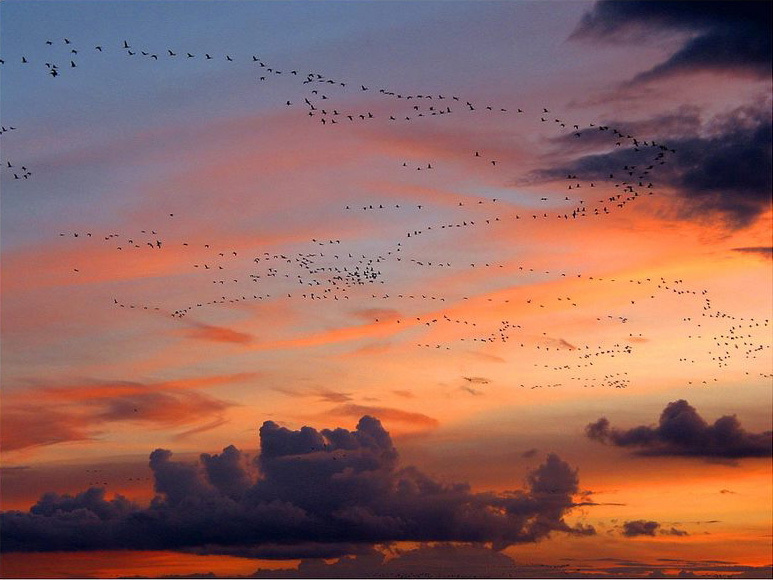 Since the very big birds (wing spread of 2.20 m) do not reach a flight altitude of more than 100 meters over the ground and their journey is accompanied by loud melancholic blaring, the crane migration is one of the most touching nature experience of the local realm. Persons who listen closely will be able to recognise squeaky voices in between the jumble of the trompet sounds, which sound like belonging to songbirds. Actually these voices belong to squabs, whose voice hasn´t broken yet. Cranes are very social animals, which stay with the same partner their whole life and stay in the family connection at all times. Next spring-time they will greet me at my study again, carrying spring in their luggage.